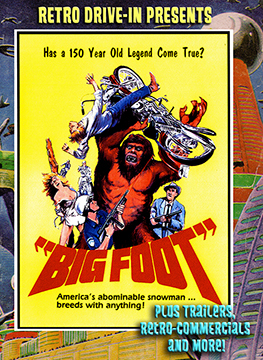 The original 1971 movie on bigfoot! This color film made the drive-in circuit throughout the summer of 1971 and featured great special effects and scantily clad hippie chicks. Has a 150-year-old legend come true? In the wilds of the rugged Northwest humans are captured by the legendary bigfoot. It soon becomes evident that a whole colony of these creatures exists and they intend to mate with their prey! As the original poster for the movie said: “America’s abominable snowman breeds with anything!” Starring Chris Mitchum John Carradine, Joi Lansing, John Mitchum, and Lindsay Crosby. Plus snack bar commercials and bigfoot-troglodite trailers.